Weak Heart from Dog Food? Some Dogs Recover! A weak heart from diet problems (Diet-associated dilated cardiomyopathy-DCM) was first seen in dogs in the mid-1990s. At that time, certain breeds (i.e. Golden Retrievers and American Cocker Spaniels) were found to be more prone to this problem. Over the past few years, veterinarians have seen an increase in the number of DCM cases in many different breeds, some at very young ages, that may be diet-associated. Due to this concern, in July 2018, the FDA issued an alert to pet owners about the potential problem between some diets and heart disease in dogs. As of today, we still don’t have the answer about why some diets are linked to this disease. The group of diets that are most commonly fed in these cases is grouped into a term - BEG which stands for Boutique, Exotic, and Grain-free. The good news is that some dogs will improve and can go back to normal lives with a change in diet and supplementation of a nutrient called taurine. Lance, a 14-year-old Labrador Retriever mix, first came to CVCA in February 2017. His family was noticing coughing and breathing harder, then he seemed to faint after taking a walk. For 5 years, he ate a vegan diet (which qualifies as “boutique”) and was occasionally given dairy products and eggs. CVCA found that Lance had advanced DCM and heart failure causing his problems. We also checked the level of taurine in his body and it was very low. Lance started medications and changed his diet and was sent home that same day. At his 3-month recheck, Lance was doing great with no coughing or fainting. His heart muscle was much stronger and he got to take less medicine. By 8-months, he was better still and by 16 months, his heart was almost back to normal! Not all dogs recover like Lance. Another CVCA patient, Lucy, a 13-year-old Labrador Retriever, had similar problems. Her energy and play got a lot better with medicine and a diet change but her heart muscle never recovered. Lucy’s family is thrilled because she can play again with her 4-legged brother- swimming and running around the farm! Lance and Lucy both had serious heart disease but both were able to recover, have a lot more time with their families and feel great at home. Neither one had any coughing or fainting once they started treatment and changed their diets. Choosing a pet food is hard. There are SO many out there and many are supposed to be “premium” but may not be the best food for our pets. Most diets have a label that says it has the right recipe for dogs but many have not been tested by actually feeding that food to dogs to be sure the nutrition is right once the food is in the bag or can. Talk with your primary care veterinarian about your pet’s diet. 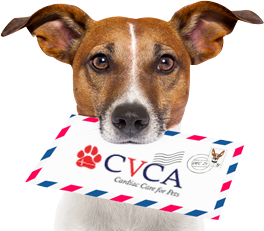 Visit CVCA’s website for more information at https://www.cvcavets.com/for-pet-owners/nutrition-grain-free/. If you are feeding a BEG diet(Boutique, Exotic, and Grain-free), consider a change to a diet with more typical ingredients and made by a pet food company with a long track record for producing high-quality diets. Food allergies, and especially grain-related allergies are uncommon in dogs. However, if your dog needs to be on a limited ingredient diet, the best and safest option may be a prescription diet from your veterinarian. For all dogs, watch for signs of heart disease that may include: rapid and/or heavy breathing, coughing, slowing down with exercise, weakness, and fainting. If noted, contact your veterinarian.